Is it yellow flesh or white flesh? Is it clingstone, freestone, or semi-freestone? Most peaches in the U.S. are yellow-fleshed. They tend to have more of an acid tang than their white-flesh counterparts. As with all peaches, you want to look for yellow peaches that feel heavy for their size, have a bit of giving when held in the palm of your hand, and, most importantly, smell like peaches when you take a whiff. These are all the signs of a ripe peach. Favored in Asia and increasingly available in the U.S., white-flesh peaches taste even sweeter than yellow peaches, in part due to their low acidity. They also tend to have a smoother, more luscious texture than yellow-fleshed peaches. From the outside, they don't necessarily look terribly different until you cut into them or peel them. Since they are relatively rare and prized, they tend to be well labeled and possibly more expensive. Freestone peach flesh does not stick to the pit, so they are preferred for eating out-of-hand. They tend to be larger and less juicy than clingstone peaches. They bake and preserve well, and can be easier to prepare since the flesh is easy to separate from the pit. The vast majority of peaches for sale to retail customers are freestone peaches. 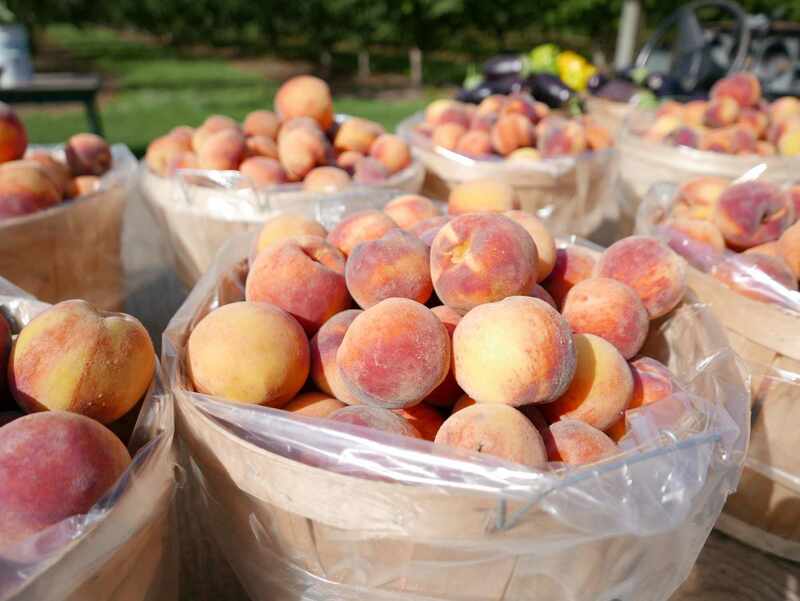 Freestone peaches come in many varieties, with seasons ranging from May to October across the country. Clingstone peaches have flesh that clings to their pits. They are softer, sweeter, and juicier than freestone peaches. Because of these qualities, they are sought after for canning and preserving and baking. Commercially canned peaches are all clingstones. One advantage of shopping for peaches at farmers markets is that you can sometimes find clingstones; most grocery stores only carry freestones. You may also find semi-freestone peaches, a hybrid of clingstone and freestones that attempts to combine the easy eating and pitting properties of freestones with the juicy sweetness of clingstones. The clingstone peach season ranges from May to August depending on the region. Donut peaches are an heirloom variety that have grown in popularity and recognition, likely due to their recognizable shape. They are flat, white-fleshed, and low in acid. This type of peach is generally available at farmers markets and specialty markets in July and August. Nectarines are, botanically speaking, a variety of peach. They are so closely related that if you plant dozens of peach or nectarine pits, a few of each will grow into the other. Some people claim that nectarines have a slightly lighter flavor, and peaches tend to be a bit more deeply flavored. Based on looks alone, the only difference is the name and the lack of peach fuzz on the smooth skin of nectarines.